We would like to thank you for visiting our web site. Our desire here at Antioch Baptist Church is first and foremost to honor and glorify the Lord Jesus Christ as well as love and serve Pueblo, CO and the surrounding communities, by giving everyone a place to call home. We know how difficult finding a church home can be. Our prayer is that through this web site we will be able to aid in making the process a little easier for you and your family. Please know that we do not take the opportunity to serve the Lord lightly. We realize that as you are “surfing the web” you are coming across many ideas, beliefs, philosophies, notions, and even superstitions that can create uncertainty and confusion in your heart and mind. Our goal is to be certain that everything you find on this web site is God honoring and based on Scripture. We would like to invite you and your family to our regular services on Sunday morning, Sunday evening, or on Wednesday night. Attending our services will give you a more personal encounter of what Antioch Baptist is all about. We do not restrict anyone from attending because of age, race, or gender. God loves all: red, yellow, black and white and so do we. As you explore our web site, if at any time you have a question regarding the church or our web site, please do not hesitate to contact us via email or you can even call the church offices and talk to someone directly. May God bless you and guide you as you endeavor to seek His will for your life. So if God leads you to Antioch Baptist Church you are invited to “Come Grow with us” and see God do a work in your life as well as in the lives of others. 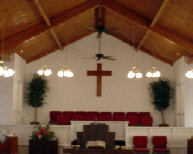 Antioch Baptist Church is an old fashion, independent, fundamental, pre-millennial Baptist church. We do not apologize for using the King James Bible, traditional (non-contemporary) music, or for believing in a Godly lifestyle in attitude and appearance in church and in public. We believe in door-to-door soul winning and old-fashioned preaching that brings conviction, conversion, and comfort. We believe and support a world-wide mission effort.